Alcohol is the most commonly used and abused substance among youth in the United States and causes significant harm. In 2017, one-third of Montana high school students reported drinking alcohol in the past 30 days, and about one in six students reported drinking to get drunk. Montana, like other states, has focused on reducing underage drinking, and efforts are making a difference. Underage drinking among high school students has been steadily decreasing over the past 25 years and is at the lowest level since 1993 (when surveys of students began). In 2017, the Montana State Department of Public Health and Human Services Addictive and Mental Disorders Division engaged the Center for Health and Safety Culture (CHSC) at Montana State University to develop and conduct a survey of Montana parents about underage drinking. The CHSC sent four mailings to a random sample of 6,400 households across Montana. Although the survey was sent to a random sample of all households, it was only relevant to households with parents. The exact response rate among households with parents is unknown but estimated to be higher than 22% (1,251 surveys were returned). Respondents had children of all ages (including adult children); over half (57%) were female; about one-third (32%) lived in areas with a population of 50,000 or more; about one-quarter (27%) lived in areas with a population of 2,500 or less. In general, respondents were older and more educated than the general population. About two-thirds (64%) indicated they had consumed alcohol in the past 30 days. Analyses of responses shows that most parents in Montana are engaging in protective behaviors to reduce underage drinking. Parents are having conversations with their children about alcohol; they are teaching their children about alcohol, its risks, and setting clear expectations about not drinking (and consequences); they are recognizing the need to model safe drinking behaviors and are monitoring their children; they are following and holding high standards; and they are acknowledging their children when they make healthy choices. While most parents are engaging in these protective behaviors, there is still room to grow. Most parents in Montana have clear expectations that underage drinking is not acceptable. Most parents disapprove of underage drinking, and many believe children should not drink until age 21 or older. Most believe parents should not allow high school age children to drink in their home, parents should establish clear rules and consequences about not drinking, and parents should discuss their children’s future personal choices about alcohol to prepare their children for when they turn age 21. Most parents have healthy beliefs about alcohol and underage drinking. They do not believe alcohol is necessary for celebrations and understand that underage drinking is harmful. Most parents also support enforcement of existing underage drinking laws. Most know that providing alcohol to a minor (other than their own child) is illegal. The survey also examined the social and emotional competencies of parents and how these relate to their engagement in protective behaviors to reduce underage drinking. A strong correlation was found. Parents with strong social and emotional competencies are over six times more likely to engage in protective behaviors than parents with low social and emotional competencies. These results provide a better understanding of the existing, positive culture among Montana parents to reduce underage drinking. While most parents have protective beliefs and are engaging in protective behaviors, there are still too many parents who are not. Efforts with parents should seek to grow social and emotional competencies as well as protective beliefs and behaviors about underage drinking. A conversation guide as well as answers to frequently asked questions are provided. Alcohol is the most commonly used and abused substance among youth in the United States. In the U.S., underage drinking resulted in approximately 119,000 emergency room visits (in 2013) and more than 4,300 deaths (in 2010). Underage drinking leads to academic problems in school, legal problems, physical and sexual assaults, unwanted pregnancies, suicides, vehicle crashes, abuse of other drugs, and lifelong impacts to brain development.1 In 2017, one-third of Montana high school students reported drinking alcohol in the past 30 days, and about one in six students reported drinking to get drunk (consuming four or five drinks in a couple of hours). 2. Centers for Disease Control and Prevention (CDC). 1991-2017 High School Youth Risk Behavior Survey Data. Available at http://nccd.cdc.gov/youthonline/. Accessed on November 6, 2018. The CHSC pilot tested several versions of the survey using an internet convenience sample before administering the final version using a mailed paper survey. The CHSC sent four mailings including a pre-survey letter, a survey packet (cover letter, survey, and business reply return envelope), a reminder / thank you postcard, and a second survey packet to a random sample of 6,400 households across Montana. Slightly less than 12% (749) were undeliverable addresses, and 1,251 surveys were returned resulting in a 22% response rate. All paper surveys were hand coded by trained CHSC staff. The survey was sent to a random sample of all households but was only relevant to households with parents; the exact response rate among households with parents is unknown but estimated to be higher than 22%. Respondents had children of all ages (including adult children). Slightly over half (57%) of the respondents were female; about one-third (32%) lived in areas with a population of 50,000 or more; about one-quarter (27%) lived in areas with a population of 2,500 or less. In general, respondents were older and more educated than the general population. About two-thirds (64%) indicated they had consumed alcohol in the past 30 days (similar to the results of the 2017 Behavioral Risk Factor Surveillance Survey3 which indicated 59% of Montana adults had consumed alcohol in the past 30 days). 3. Centers for Disease Control and Prevention, National Center for Chronic Disease Prevention and Health Promotion, Division of Population Health. BRFSS Prevalence & Trends Data. Available at https://www.cdc.gov/brfss/brfssprevalence/. Accessed on November 6, 2018. While survey respondents had children of all ages, the responses shown below represent parents with a child between the ages of 11 and 24 (parents of adult children were asked to think about their behaviors when the child was in high school). Most parents in Montana (82%) regularly engage in a conversation with their child about alcohol and its impact on health and safety. Most parents in Montana (71%) regularly ask their child if they have any questions about alcohol or drinking. Most parents in Montana (71%) regularly check in with their child about if they feel pressure to drink. Most parents in Montana (78%) regularly talk with their child about their own current choices regarding drinking (when they drink, when they don’t drink, how much they drink, their decisions about driving after drinking). Most parents in Montana (60%) regularly talk to their child about brain development and how teenagers’ brains are still developing. Most parents in Montana (79%) regularly talk to their child about ways to manage peer pressure and what to do if they are in a situation where drinking is occurring. Most parents in Montana (66%) have established a clear rule for their child about never drinking alcohol. Most parents in Montana (92%) have established a clear rule for their child about never riding in a vehicle with a driver who has been drinking. Most parents in Montana (80%) have established clear consequences with their child about what happens if these rules are violated. Most parents in Montana (88%) have a clear rule about when their child should be home (a curfew). Most parents in Montana (74%) have started to discuss with their children what safe and appropriate guidelines for drinking may be when they reach age 21. Most parents in Montana (90%) think about their own drinking behaviors and what they are modeling for their child. Most parents in Montana (86%) always monitor their child when they are out by doing things like having them call or text. Most parents in Montana (84%) always find out if an adult is present when their child goes to someone else’s house. Most parents in Montana (79%) restrict access to alcohol for their child in their home. Most parents in Montana (87%) always uphold rules about not drinking alcohol. Most parents in Montana (89%) consistently uphold rules about when their child should be home (a curfew). Most parents in Montana (89%) consistently uphold rules about having their child call or text when they are out. Most parents in Montana (85%) consistently follow through on consequences when their child breaks a rule about drinking. Most parents in Montana (79%) wait until they calm down to discuss when their child breaks rules about being home on time or drinking. Most parents in Montana (94%) regularly acknowledge their child when they follow the rules they have established. Most parents in Montana (97%) have allowed their child more freedom as they have demonstrated responsible behavior. The responses shown below are for parents with children of all ages – even adult children. 54% of adults in Montana would not allow their child to drink alcohol until the age of 21 or older (other than for religious purposes). Most parents in Montana (91%) disapprove of high school students drinking alcohol. Most parents in Montana (62%) disapprove of people age 19 and 20 drinking alcohol. Most parents in Montana (74%) agree parents should not let their high school age children drink alcohol at home. However, many parents (44%) perceive that most parents would not agree, and many (52%) perceive that most adults in Montana would not agree. Most parents in Montana (94%) agree parents should establish rules and consequences about not drinking for their high school age children. However, some parents (26%) perceive that most parents would not agree, and many (36%) perceive that most adults in Montana would not agree. Most parents in Montana (93%) agree parents should discuss their children’s future personal choices about alcohol to prepare their children for when they turn age 21. However, many parents (25%) perceive that most parents would not agree, and many (33%) perceive that most adults in Montana would not agree. Most parents in Montana (75%) disagree that alcohol is a necessary component of celebrations. Most parents in Montana (80%) agree that the teenage brain is more susceptible to problems like alcohol abuse or alcohol addiction. Most parents in Montana (68%) agree that adults drinking in front of children can increase the likelihood that a teenager drinks. Most parents in Montana (90%) disagree that as long as youth do not drive after drinking, drinking among teens is safe. Most parents in Montana (80%) agree that high school youth risk harming themselves (physically or in other ways) if they drink alcohol (other than for religious purposes). Most parents in Montana (68%) agree that establishing rules about alcohol will reduce the likelihood that their child drinks. Most parents in Montana (90%) agree that local law enforcement should strongly enforce laws regulating alcohol use by youth under age 21. Most parents in Montana (86%) agree that adults who provide alcohol to underage youth in violation of Montana law should be arrested and prosecuted. Most parents in Montana (80%) agree that their community should adopt or strongly enforce their existing social hosting ordinance, which makes it unlawful for adults to allow underage youth (other than their children) to drink alcohol in their home. Most parents in Montana (88%) believe it is illegal to provide alcohol to someone other than their child under the age of 18 in their home. 1% believe it is legal, and 11% are unsure. The survey measures the social and emotional competencies of parents in five skill areas. The ratings of their own skills are divided into three groups – low, moderate, and high skill levels. The ratings for each skill area are averaged for an overall measure. 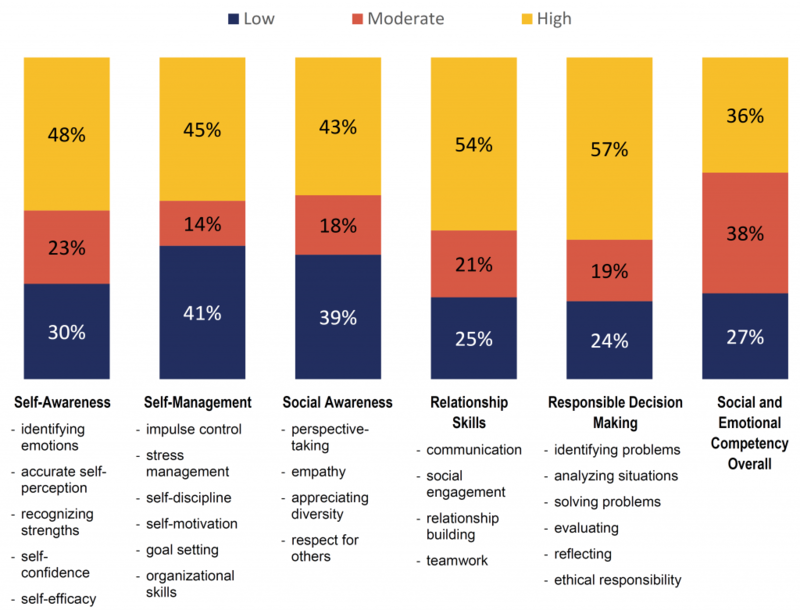 As shown in the chart below, more parents rate themselves as highly skilled in responsible decision making than any other skills. Many parents rate themselves as having low skill levels in self-management and social awareness. Social and emotional competencies of parents are strongly correlated with their engagement in protective behaviors to reduce underage drinking. Parents with high social and emotional competencies are over SIX TIMES more likely to report high engagement in protective behaviors to prevent underage drinking. The survey measures to what degree parents engage in a socially- and emotionally-informed process in parenting activities. The process is based on a foundation of strong relationships and communication. About half of parents rate themselves as having a strong relationship and strong communication with their child. While many parents rate themselves at high levels, there is significant room for growth. Parents rate their engagement in six steps in a socially- and emotionally-informed process. Most parents (58%) rate themselves as highly engaged in recognizing their child when they do well. Many parents rate themselves as having low engagement in the teaching, practicing, and supporting steps. Engaging in constructive dialogue about these results has the potential to improve outcomes in your community by revealing new understanding and opportunities. Otto Scharmer, in his research on organizational and community change, has recognized the importance of preparing ourselves to learn from new information. He calls this “Quieting the Voices.” He has noted three voices that can inhibit us from learning and engaging in constructive dialogue: the voice of judgement, the voice of cynicism, and the voice of fear. We encourage you to intentionally reflect on how you respond to the results shared in this report and how these voices may be getting in the way of you seeing and learning new information. We encourage you to acknowledge these voices and try to “quiet” them as you engage in dialogue about these results. 4. Scharmer, C. O. (2009). Theory U: Leading from the Future as It Emerges (1st edition). San Francisco, Calif: Berrett-Koehler Publishers. What has had real meaning for you from what you have seen in the data? What has been your major learning, insight, or discovery so far from these data? How do these results challenge our current approaches? 5. Adapted from Brown, J., Isaacs, D., Community, W. C., Senge, P., & Wheatley, M. J. (2005). The World Café: Shaping Our Futures Through Conversations That Matter (1 edition). San Francisco, CA: Berrett-Koehler Publishers. Don’t most people lie on surveys? For over 100 years, social science has relied extensively on self-reported information using surveys. While some people do lie, most people do not – especially when surveys are anonymous and there is a low sense of reprisal (i.e., sense of getting in trouble) for being honest. To assess the quality of the responses, we examine both the internal consistency of the responses as well as how the responses compare with other surveys. This survey included over 32 scales (composite measures using multiple questions). The internal consistency of these scales was strong – indicating that people were answering in consistent ways and not just picking any answer. 6. Montana Department of Public Health and Human Services. (2018). Montana Social Indicators Data System. Retrieved from http://www.bach-harrison.com/mtsocialindicators/. How can only 1,251 responses represent the state? When you have the cholesterol level in your blood measured, the doctor does not remove all of your blood. A relatively small amount of your blood is sampled (and an even smaller amount goes into the machine that actually measures the cholesterol). Similarly, a relatively small sample of people can be a good representation of a larger group. In this survey, households were selected randomly – so everyone with a mailing address had an equal chance in participating. This random selection greatly improves the representativeness of the results. The results do have limitations in that they do not represent people who do not have a mailing address or do not read English. Is underage drinking in Montana really going down? Yes. Underage drinking is going down in Montana and across the United States. This is a result of the national and Montana’s focus on reducing underage drinking for the past 20 years. There are many dedicated professionals working across Montana to reduce the misuse of substances by youth, and their efforts are making a difference. Is underage drinking just going down because youth are using other drugs like marijuana? No. High school use of cannabis (e.g., marijuana) has stayed about the same in the past 15 years (about 20% of high school students in Montana report using cannabis in the past 30 days).2 The misuse of prescription pain medicine has increased in the past decade; however, lifetime use is significantly lower than alcohol (about 14% compared to 68%).2 Prescription pain medicines are very dangerous. Download the 2017 Montana Parent Survey Key Findings Report. Recommended Citation: Center for Health and Safety Culture. (2018). The 2017 Montana Parent Survey Key Findings Report, Bozeman, MT: Montana State University.